Over the years, more and more companies are shying away from a single, monolithic system for obvious reasons. 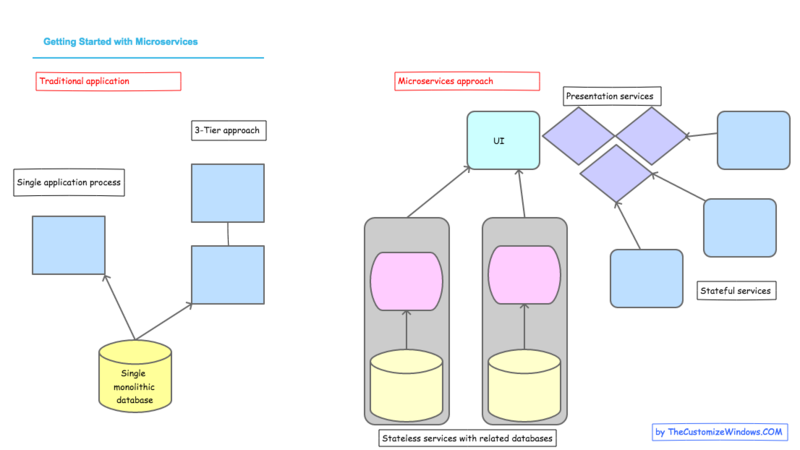 Why a monolithic approach is efficient for smaller web services and applications, it is not the best approach to take when the user have complex needs and bigger systems to run. Companies with more complex needs are now relying on microservices as a solution. Microservices bring several advantages to the table and can be implemented quickly if necessary. In this article on getting started with microservices, we are going to discuss how the reader too can get started with microservices easily. While currently there is no standard for microservices, the industry mutually agrees on some characteristics which a microservices architecture should follow. With microservices we can break down large sets of code so that smaller development teams can focus on high-velocity release cycles. With a large monolithic application, fast reliable deployments for quick adding new features can be problematic. 3 Why Switch to Microservices? 4 Challenges of Using Microservices? Unlike a monolithic system, microservices take the approach of Service-Oriented Architecture (SOA) and pushes it a step further. A big system is further divided into smaller services – hence the name “microservices” – and run independently from each other. It is then up to the individual services to communicate with each other. The approach means even the most complex system can be constructed using smaller, more manageable microservices as the building blocks. In a system that requires a front-end UI, a database framework, and a core for data processing, all three elements can be configured to run as their own microservices. As mentioned earlier, the main goal of using microservices is to make complex systems more manageable. That said, there are a lot of practical advantages you will gain by taking this approach. For the starters, the modular nature of microservices means creating multiple redundancies and maintaining the system in general are both very easy to do. There is no need to bring the whole system offline if you only need to update or make changes to one or two services. The microservices approach also enables better server resource management. Resource-intensive services can receive more server resources through virtual or physical allocation, while lighter services can share the resources of a single physical server for maximum efficiency. There is one other big advantage that the microservices approach offers, and that is immense flexibility. With each part of the system running as a microservice, there is no need to stick with a single programming language or technology. In fact, developers can mix multiple languages, frameworks, and data-storage technologies to achieve the best results. What Are the Challenges of Using Microservices? The way individual services talk to each other is very similar to that of a UNIX system. Each service can issue a request and receive a response from the other services. When implemented correctly, microservices can help bring the efficiency level of a system to a whole new level. However, there are some challenges to overcome too. When a service becomes unreliable in issuing responses to requests from other services, the reliability of the whole system is at risk. Microservices also makes deploying a distributed system slightly trickier. The use of Kubernetes and Docker makes deploying microservices a lot easier these days. There are ready-made solutions that allow developers to quickly develop, deploy, and update services too. It is clear that microservices is the way forward. Now is the perfect time to take advantage of this new architecture and enjoy its benefits. This Article Has Been Shared 3629 Times! Here Is How To Install Apache Mahout On Ubuntu 16.04 For Machine Learning Development. We Can Install & Integrate Mahout With Spark, Hadoop. What is Data Mart? A data mart is a special version of data warehouse. Data marts are small data warehouses focused on a specific business area or topic within an organization. Cite this article as: Abhishek Ghosh, "Getting Started with Microservices," in The Customize Windows, December 11, 2017, April 21, 2019, https://thecustomizewindows.com/2017/12/getting-started-with-microservices/.